. . .Martian winter corresponding to the end of February with us. About the end of March the cap begins to shrink in size (in the Northern Hemisphere), and this goes on so rapidly that early in the June of Mars it is reduced to its minimum. About the same time changes of colour take place in the adjacent darker portions of the surface, which become at first bluish, and later a decided blue-green; but by far the larger portion, including almost all the equatorial regions of the planet, remain always of a reddish-ochre tint. A fascinating look at early thinking about astrobiology and the Martian canal debate from the late nineteenth and early twentieth century. The Victorian language and sometimes lengthy discussions probably don't lend themselves to casual reading, though. A bit dry, but it really helped me grasp just how brilliant the early 1900's scientists were. And they did it all with slide rules and on paper. Amazing what was observable and deducible with such primitve equipment. 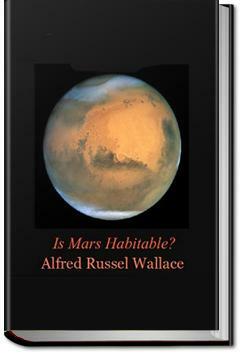 Wallace was one of the first to dispute Lowell's theory of civilized Mars, and he puts down Lowell hard. Planetary science is no place for those with thin skins!